Measuring your pneumatic equipment for reliability and precision with a dependable calibration tool is critical in avoiding fatal errors. Precision and reliability are exactly what the VenTest Series provides. 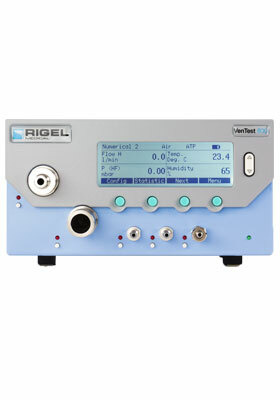 The VenTest measures flow, pressure, temperature, humidity and O2 concentrations bi-directionally. The adult, pediatric and high-frequency ventilation measuring modes make the VenTest the ideal calibration tool for all ventilators, anesthesia machines and spirometers. The VenTest distinguishes itself from other calibration tools by combining a simple, intuitive multilingual user interface with the most precise sensor technology. With the push of a button, all measured values can be stored directly on the VenTest and later retrieved for documentation purposes. Optional FlowLab™ software provides a simple and useful tool to analyze all ventilation parameters including real time flow / pressure curves, functional zoom and certification papers.